The Finnish Maritime Administration confirmed the identity of 300 year-old frigate Huis te Warmelo on Monday. The vessel, which was found at a depth of 64 metres near Helsinki, was once part of the Dutch navy, more specifically a region known at the time as West Frisia. The ship was identified on the basis of hull dimensions, location, structure and its canon fire power. 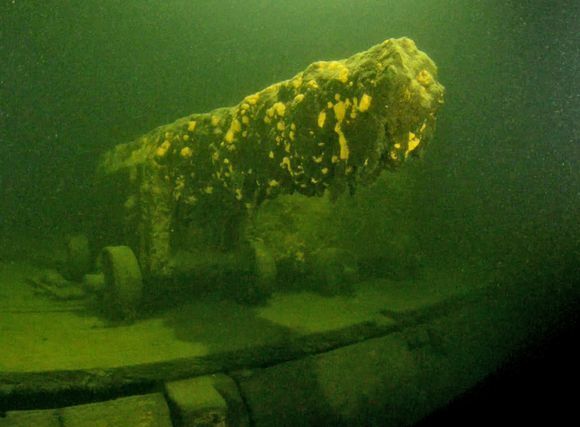 Divers reported that the vessel was extremely well-preserved and that the wooden structures were in surprisingly good condition, since all of the canons were still located on the gun deck. The ship was a member of the West Frisian Admiralty or navy and had been built in Medemblik, a port town in the West Frisia region of modern-day Netherlands. No other frigate from the latter part of the Dutch golden age has been found in such sound condition. The Huis te Warmelo apparently ran aground in the shallows off Helsinki before quickly sinking to the sea bottom. The ship was first detected years ago when the maritime administration MKL conducted a seabed mapping exercise. However documentation of the wreck didn’t begin until 2014. At that time it was confirmed that the vessel was a 35-metre triple-mast frigate. Research indicates that the ship sank in an upright position after running aground, explaining why all 17 canons on the upper gun deck are still in their original positions. Researchers leaned on Russian and Swedish archive material to determine that the ship didn’t belong to either seafaring power. Officials then stated looking to other countries with naval forces. Historian Peter Swart helped solve the mystery of the ship’s origins when he unearthed an old Dutch sea chart, which marked the spot where the war ship had gone down. The date of the sinking was recorded as 1715. Researchers plan to continue their work during the summer. Weather conditions permitting, the Finnish research company SubZone will dive to probe the wreck and further document their findings. One of their main goals will be to verify the name of the vessel.